For millions of people worldwide, livestock is a key asset that offers multiple benefits, providing food and income, draft power, manure, economic security and social status. When disaster strikes, the loss of livestock affects the livelihood of livestock-dependent households, and has larger implications for the whole livestock economy and the food security of the population. Effective emergency responses should be framed around the livelihoods approach, offering a combination of short-term emergency relief and long-term resilience strengthening. 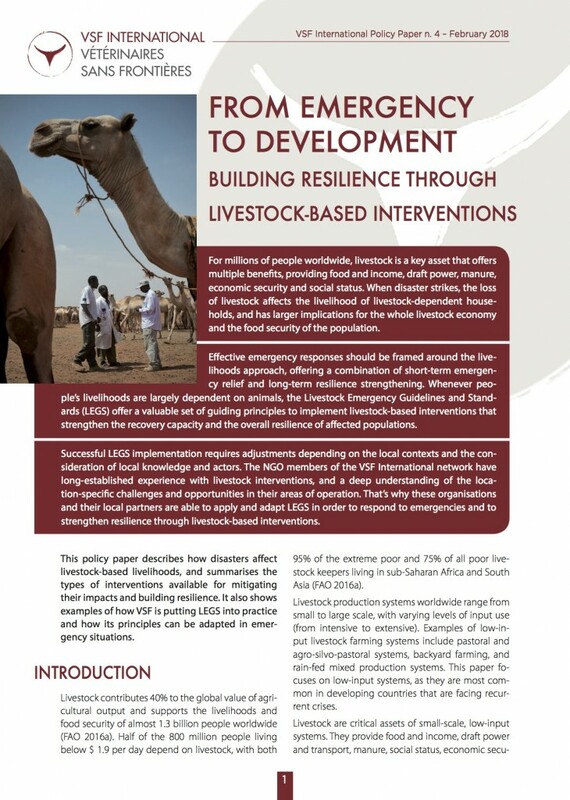 Whenever people’s livelihoods are largely dependent on animals, the Livestock Emergency Guidelines and Standards (LEGS) offer a valuable set of guiding principles to implement livestock-based interventions that strengthen the recovery capacity and the overall resilience of affected populations. Successful LEGS implementation requires adjustments depending on the local contexts and the consideration of local knowledge and actors. The NGO members of the VSF International network have long-established experience with livestock interventions, and a deep understanding of the location-specific challenges and opportunities in their areas of operation. That’s why these organisations and their local partners are able to apply and adapt LEGS in order to respond to emergencies and to strengthen resilience through livestock-based interventions.